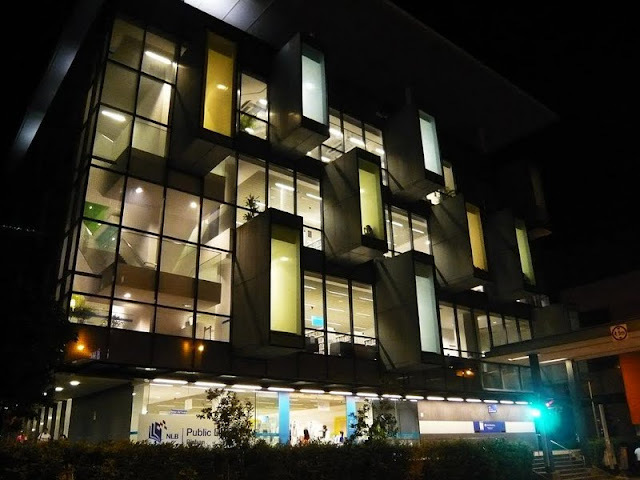 Travel photos of Bishan Community Library at 5 Bishan Place, Singapore. Bishan community library designed by LOOK architects has brought learning fabric into an expression of art on the exterior facade and layers of internal facade. Individual learning space and unexpected space were seen as if they are in a interlocking and extruding manner on the facade. The private learning space is achieved by having a series of cubical space, sense of silence is even perceived when one be inside of it. What is more interesting is that the private learning spaces are visually and spatially connected to the whole as well. This articulates the ever fluid social behavior in a diverse manner and they are celebrated through the layering of facade in the eye of the public and the street. Good things about the program of the building is that it articulates public life with provision of cafe on ground floor, with series of hidden spaces at the outside. Public library is opened for the public and for Malaysian who wants to borrow books from it will just have to pay a 10$ for a life long membership.